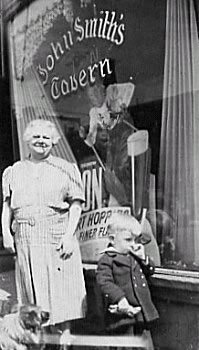 My grandmother, Louise Winters Smith, in front of the tavern she owned with my grandfather, John Smith(above). The place, on Lang Street, Down Neck, was a few doors in from Wilson Ave. and operated in the 1940s. The sign on the window advertised Fiegenspan's PON, but from all I heard they loved and only drank Hensler's. My grandparents lived near by in a house on the corner of Elm Street and Lang St. Their kids were Michael and Kate (my Mom), who went to Ann St. School and ESHS.